Includes an extended behind-the-scenes conversation with author/narrator Rinker Buck with his brother and trail companion Nick Buck. 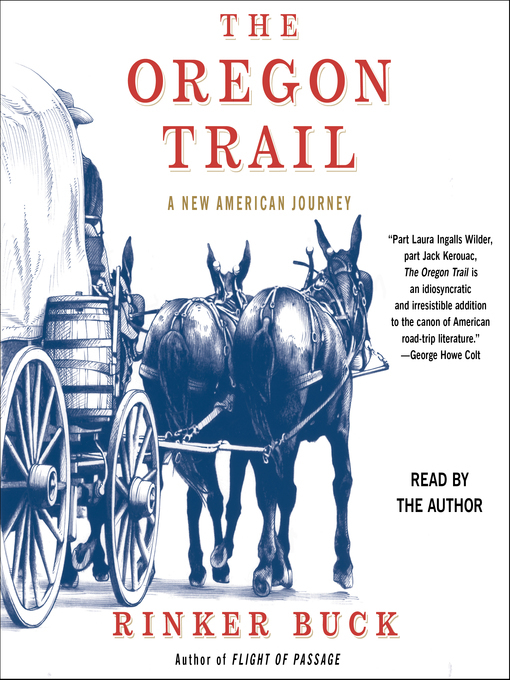 In the bestselling tradition of Bill Bryson and Tony Horwitz, Rinker Buck's The Oregon Trail is a major work of participatory history: an epic account of traveling the entire 2,000-mile length of the Oregon Trail the old-fashioned way, in a covered wagon with a team of mules—which hasn't been done in a century—that also tells the rich history of the trail, the people who made the migration, and its significance to the country. Spanning 2,000 miles and traversing six states from Missouri to the Pacific Ocean, the Oregon Trail is the route that made America. In the fifteen years before the Civil War, when 400,000 pioneers used it to emigrate West—historians still regard this as the largest land migration of all time—the trail united the coasts, doubled the size of the country, and laid the groundwork for the railroads. The trail years also solidified the American character: our plucky determination in the face of adversity, our impetuous cycle of financial bubbles and busts, the fractious clash of ethnic populations competing for the same jobs and space. Today, amazingly, the trail is all but forgotten. Rinker Buck is no stranger to grand adventures. The New Yorker described his first travel narrative, Flight of Passage, as "a funny, cocky gem of a book," and with The Oregon Trail he seeks to bring the most important road in American history back to life. At once a majestic American journey, a significant work of history, and a personal saga reminiscent of bestsellers by Bill Bryson and Cheryl Strayed, the book tells the story of Buck's 2,000-mile expedition across the plains with tremendous humor and heart. He was accompanied by three cantankerous mules, his boisterous brother, Nick, and an "incurably filthy" Jack Russell terrier named Olive Oyl. Along the way, Buck dodges thunderstorms in Nebraska, chases his runaway mules across miles of Wyoming plains, scouts more than five hundred miles of nearly vanished trail on foot, crosses the Rockies, makes desperate fifty-mile forced marches for water, and repairs so many broken wheels and axels that he nearly reinvents the art of wagon travel itself. Apart from charting his own geographical and emotional adventure, Buck introduces readers to the evangelists, shysters, natives, trailblazers, and everyday dreamers who were among the first of the pioneers to make the journey west. With a rare narrative power, a refreshing candor about his own weakness and mistakes, and an extremely attractive obsession for history and travel, The Oregon Trail draws readers into the journey of a lifetime.